What Makes a Great Quilt Husband? Is a Great Quilt Husband really like Santa Claus, unicorns, and a truly free lunch? I think not. This weekend I was reminded that I am married to a really, really Great Quilt Husband. Which, of course, begs the question: what makes a Great Quilt Husband (GQH)? A Great Quilt Husband uses his powers for good. On Sunday, I taught a private lesson at the quilt shop and then I taught an art quilt class. 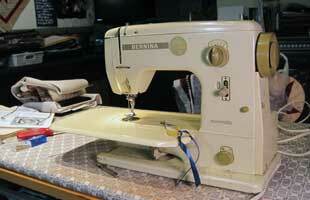 During this time, my GQH broke down my sewing table and installed the insert for my Bernina 820. While he was at it, he reinforced the table since the 820 is heavier than my last machine. My entire studio is a reflection of his building and design skills. A Great Quilt Husband knows how to answer design questions. A coworker of mine tells me that her husband always answers her design questions (Do I need more quilting? Do I need to change this color?) “yes.” He says that if she’s asking, then she knows there’s something wrong that needs to be addressed. My GQH listens to my questions, discusses the options, and then understands that his input is part of the process, not necessarily the direction I’ll take. A Great Quilt Husband is patient. Need I say more? Okay. My GQH is patient with the number of hours I spend in my studio, the time I take with quilt-related activities outside of the house, and the effort it takes to plan the classes I teach and help my students. 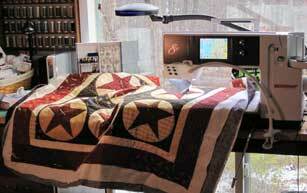 A Great Quilt Husband understands that quilting will eventually take over the entire house. You’ve heard the joke? My husband is in charge of the garage, the attic, the utility room, and everything outside the house. The rest of the house is open for quilting activities and storage. What other attributes does a Great Quilt Husband have? You tell me. I had a wonderful day today. I spent the work portion of the day at the local quilt shop where I am the Bernina manager and then I came home and worked on a very old Bernina for a neighbor. Don’t be afraid of bigger needles. I had a client who was repairing a microtex jacket using a satin stitch. She had tension and stitch width issues with an 80 universal needle, but all was wonderful with a 100 jeans needle. Match the needle to the job. Keep in mind the needle may be larger than you would expect. If your top thread is wound on the spool in flat rows, like Superior, Signature, or Sulky, you may run into some top tension issues. To avoid this, swing the multi spool holder out to the right and hook the thread on to an arm of the telescoping wand that is not directly above the spool. This should ensure that the thread pulls away from the spool rather than directly up where it can catch on the end of the spool and get hung up. 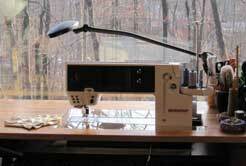 If you are freemotion quilting without your BSR, consider using a #15 foot. My tech just recommended this to me and I really like it. The opening is bigger and the front end is curved up ever so slightly. It makes all the difference. If you are quilting with your BSR (8 Series machines only) and you are experiencing skipped stitches, you may need to have your spring replaced. Ask your tech; it’s an easy fix. My BSR functions beautifully now with the new spring. When I got home tonight, I worked on an ancient Bernina for my neighbor. I should be careful who I call “ancient!” The machine was born in the 60’s and so was, well, never mind. My neighbor asked me to look at the tension because she was having trouble adjusting it. The machine is a gem! It’s a 707 Minimatic that was purchased in Africa. The manual is in Dutch, which my neighbor speaks, but I had to rely on the pictures. After a thorough cleaning and some oil, the machine is working again and the tension is perfect.